March 30, 2009. The North Fork of the Owyhee River from the Idaho-Oregon State border upstream to the upstream boundary of the North Fork Owyhee River Wilderness. Wild — 15.1 miles; Recreational — 5.7 miles; Total — 20.8 miles. 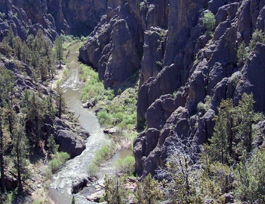 The North Fork Owyhee River, characterized by steep, vertical walled canyons, emerges from the North Fork Owyhee Wilderness and flows west toward Oregon. Its designation changes from wild to recreational at the Juniper Mountain Road crossing, but its 'wild' character throughout creates an outstanding canyon experience for experts-only boating during high spring flows. These canyonlands and rivers have provided essential resources, shelter and life for the Shoshone and Paiute people for countless generations. The tribes took refuge in the canyonlands during conflicts with European settlers. They subsisted on seasonally available game, such as antelope, deer, elk, bison (residents of southern Idaho until the early 19th century) and bighorn sheep; roots and bulbs, such as bitterroot and arrowleaf balsamroot; and small game. The Owyhee, Bruneau and Jarbidge rivers served as the migration route and spawning areas for anadromous fish that were important to the tribes. A part of tribal culture was lost when dams blocked the salmon from migrating into the rivers' upper reaches. Petroglyphs, pictographs, rock alignments, shrines and vision quest sites are located throughout the canyonlands. Tribal members still frequent the canyonland areas to hunt, fish, pray and conduct ceremonies, and the areas will continue to be a special place for the tribe for generations to come. Floaters using the canyons today are preserving a culture of adventure and solitary recreation within the sheltered canyons. The Owyhee River System is home to a rare plant, the Owyhee River forget-me-not. Found nowhere else but this river system, this species occupies north-facing vertical rhyolitic cliffs, sheltered crevices and shady grottos. The pale blue flowers of this species contrast sharply with the backdrop of dark volcanic rock. May and June are the best time to view this species in full flower. The North Fork Owyhee supports sensitive redband trout populations, as does the Owyhee River and its other tributaries. However, warm summer water temperatures are insufficient to support productive redband fisheries. The success of fisheries in these systems depends on appropriate flows during key life stages. These rivers exhibit typical flashy, desert streamflows to which the resident fish species are adapted, and low flows in summer and early fall are sufficient to maintain standing pools for fish survival. The high flows that may occur only every few years are integral to the maintenance of channels that support pool depths and channel diversity. As the North Fork Owyhee corridor is initially dominated by weathered, sculpted rhyolite (rock that began as lava flow) formations nestled in the rubble slopes below vertical walls of basalt create pinnacles known as "hoodoos." The canyon then changes to one engulfed in sheer blocky basalt walls. The canyons of the Owyhee River and its tributaries possess predominately Miocene Era volcanic formations, and the Owyhee, Bruneau and Jarbidge river systems provide the largest concentration of sheer-walled rhyolite/basalt canyons in the western United States. Boating opportunities and activities are supported by high water flows during spring and early summer. A high-quality, 18-mile section from the North Fork Campground to the confluence with the Owyhee River in Three Forks, Oregon, is recommended for expert boaters in kayaks and small catarafts. After warming up on a few Class II-III rapids, boaters encounter steep Class III-IV rapids (depending on flow). There are many locations from which to hike from the canyon rim to the stream, especially during low-water periods. The canyons provide exceptional opportunities for solitude, wildlife viewing and photography. The North Fork Owyhee is characterized by narrow canyons as great as 500 feet deep, dominated by a coarse-textured, red, brown, or blackish eroded cliffs, often glazed with yellow to light green micro-flora. The Owyhee Canyonlands provide both upland and canyon riparian habitats for a number of wildlife species common to southwestern Idaho. Big game commonly found in the area include California bighorn sheep, elk, mule deer and pronghorn. Common large and mid-sized predators in the area include cougars, bobcats, coyotes, badgers and raccoons. Small mammals include rodents (mice, kangaroo rats, voles, squirrels and chipmunks), rabbits, shrews, bats, weasels and skunks. The waters along the entire Owyhee River system are considered outstanding habitat for river otter. A variety of bird species occur in the area, including songbirds, waterfowl, shorebirds and raptors. The high, well-fractured and eroded canyon cliffs are considered outstanding habitat for cliff nesting raptors, a small number of which occasionally winter along the canyon walls of the upper Owyhee River system and its major tributaries. Other wildlife includes several snake and lizard species, as well as a few amphibians. The area is considered Preliminary Priority Habitat for greater sage-grouse. Idaho BLM sensitive species include bald eagles, yellow-billed cuckoos, prairie falcons, ferruginous hawks, several neotropical migratory bird species, several bat species, Columbia spotted frogs and western toads. Cliffs also support spotted and Townsend's big-eared bats, both Idaho BLM sensitive species.